Have a Free BURL on the WMS - Alice & the Mad Tea Party Slot. Alice & The Mad Tea Party is a WMS – Williams powered video slot. It is based on Alice Adventures in Wonderland, a novel originally written by Charles Lutwidge Dodgson. This novel was published and released in 1865 under author pseudonym Lewis Carroll. A girl, Alice, by accident falls into a rabbit hole that leads her into a fantasy world, aka Wonderland. This online slot features 30 fixed paylines spread across five reels. It offers you 7 bonus features, 5 of which are triggered randomly. True to its name, the Alice & The Mad Tea Party pokie machine is offered with a mix of symbols including a Rabbit, Mad Hatter, Alice herself, Cheshire cat, Queen, Tea set, Drink Me Potion and Eat Me Cake. There are also four playing cards symbols to look out for. Another trending hot WMS slot this month is Bruce Lee Dragons Tale. This is a great online slot for low stake rollers. It is however not a preserve for those who can spare a few coins but for anyone who can enjoy a childhood classic story. Paylines are fixed meaning you can only play on all 30 lines. Below the gaming screen, you will see control buttons through which you should set your bet and get reels in motion. There is an auto-play feature that enables you to automate a set number of games while you grab another brew from the fridge. Other buttons include C/QB button which allows you to make a Quick Bet and Help/Pays button from where you can access feature instructions. Players can bet a minimum of $0.50 and a maximum of $2.00 per line. 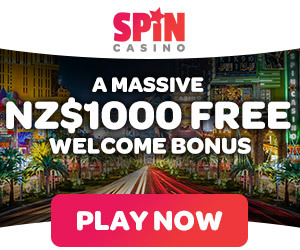 This means you can only bet a maximum of $60 in a single spin. 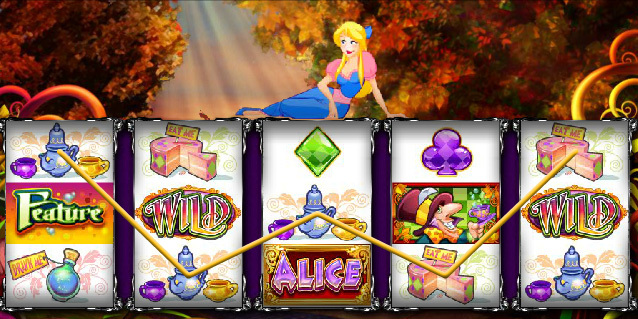 Alice & The Mad Tea Party online slot is rich in features. Wild symbols will substitute other symbols (except Feature symbol) to complete winning combinations. Not only does it help you complete winning combos, but can also multiply your wins by as high as 10x. The Feature symbol only appears on reels 1, 3 and 5. If you land the Feature symbol on these three reels, you will be rewarded with just 6 free spins. Before every free spins, you will be prompted to select a teapot which can reward you with multipliers, trigger the Super Mad Respin feature or turn some symbols into wilds. You may end up getting up to 14 free spins with 3x multiplier. Like earlier mentioned, 5 bonuses in this online slot are randomly triggered. The Mad Hatter feature is a pick bonus which lets you pick a teacup to reveal a diamond, muffin or white rabbit. It will then reward you with multipliers ranging from 2x to 10x. Alice Feature turns up to 5 reels wild while Cheshire Cat feature turns up to 15 symbols Wild. The Caterpillar bonus feature randomly awards you up to 15x your stake after any winning spin. Lastly, Queen of Hearts feature prompts you to pick a spade, heart, diamond or club after which matching reel symbols turn wild. The Super Mad Respin bonus feature is activated when you land three Alice symbols on reel 1. Once active, you will pick one of three teapots to reveal either 3 Alice symbols with a respin, 3 Alice symbols with no respin or a respin alone. In total, you can get up to 7 respins. Alice & The Mad Tea Party is an entertaining online slot and land based casino game. You can win up to 1,000 coins while at it. Though the paytable is not Williams Interactive best (regular symbols pay between 0.2 coins and 6 coins for landing between three and five of a kind), other aspects of the game are great.